Rooms for two people with a double bed, furnished in Alpine style with pale wood furnishings and carpeted floors. Equipped with all comforts – flat screen TV, safe and free Wi-Fi – they have a private bathroom with bathtub or shower, toilet and hairdryer. 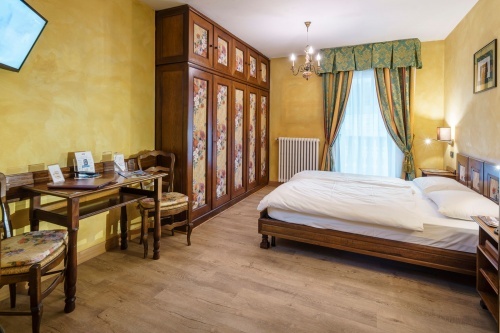 More spacious rooms for two people with a double bed, furnished in Alpine style, some with carpeted floors, some with parquet floors and balcony. Equipped with all comforts – flat screen TV, safe and free Wi-Fi – these rooms have a private bathroom with bathtub or shower, toilet and hairdryer. 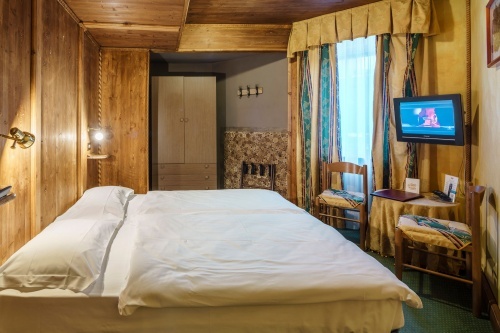 Rooms for two people with two single beds, furnished in Alpine style with pale wood furnishings and carpeted floors. Equipped with all comforts – flat screen TV, safe and free Wi-Fi – they have a private bathroom with a shower, toilet and hairdryer. More spacious rooms for two people with two single beds, furnished in Alpine style with dark wood furnishings and parquet floors. Rooms for three people furnished in Alpine style, some with carpeted floors, some with parquet floors. Rooms for one person with a single bed, furnished in Alpine style with carpeted floors. Equipped with all comforts – flat screen TV, safe and free Wi-Fi – these rooms have a private bathroom with a shower, toilet and hairdryer.